If you’re not familiar with Bullish Percent charts or how they are calculated, check out my previous post on How To Time the Market With Bullish Percent Charts. I use them to find inflection points, which is different than their creator’s intention. Even more alarming, this is the corresponding level that we last saw in October 2007, just as the brutal bear market was about to descend into Wall St. In the past 10+ years, the Nasdaq Bullish Percent Index has had a tough time going higher than 50-60%. 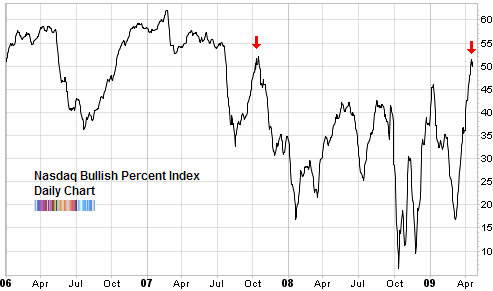 The only exception was in 2003 when we saw BPI pushed to 78% by the powerful new bull market. So not only are we back to Bullish Percent levels where the bear market started, we are at levels which have historically marked tops in the equity market. The only justification for new long positions here, or continuing to hold on to existing long positions, is the expectation that we are going to see yet another powerful non-stop rocket ride as in 2003. Anything is possible but considering everything, I think that scenario is highly improbable. A concern with figures like the first one above: the BPI was above 50% for about 9 months at the end of ‘06 and the start of ‘07. Yet no “signal” is indicated. Why not? In addition, one can’t draw an arrow to a “peak” until some time after an index retreats from that peak. 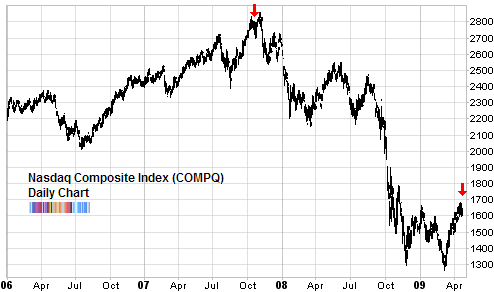 For example, there is a red arrow at the BPI peak in Oct ‘08. But at the time that peak occurred, the value was significantly below the BPI values just a few months prior. How did one know AT THAT TIME, that a reading of slightly over 50% would be a peak? One didn’t know until perhaps a month later when one could look back and see that it was a peak. Similarly, how do we know now that the current reading is a peak. It may go higher in the the coming days/weeks. It may go lower. Only in hindsight does one know when a peak has occurred. I see this as a problem with most indicators that are read as giving signals at peaks. One simply doesn’t know that a peak has occurred until significantly after the fact. P.S. My new web address is http://optionexperiments.wordpress.com, where I track my option trading. Sorry for all these comments. I’m trying to get the system to change its record of my web address.